Wonderful piece and SO TRUE! I recall an English language section in a Parisian bookshop years ago that forced an acquaintance with Fowles “The Magus” and Stephen’s “The Crock of Gold”. Thank heavens for no choice. I live in a small town in the southern U.S.. Bad bookstores truly exist here, specifically the used book retailers and the Christian (evangelical) bookstores. Book resale shops contain the worst of southern Americans’ reading choices: endless rows of romance novels of every variety, Christian fiction (my town is in the Bible Belt region), and non-fiction geared to an audience of right-wing political junkies. Christian bookstores sell the new versions of Christian fiction and right-wing political diatribes. Fill-in-the blank Bible study aids abound, as well as Sunday school coloring books. 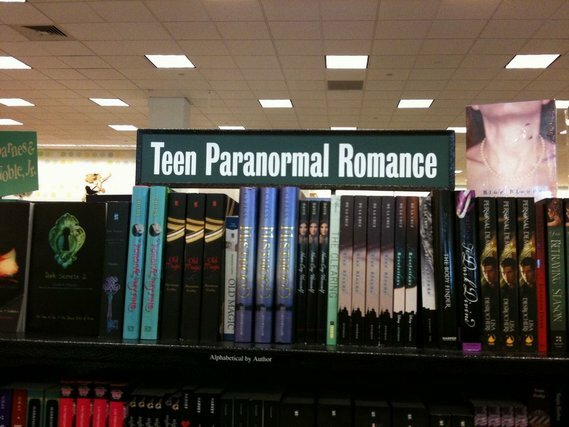 The romance genre is taboo in a Christian bookstore. The Christian love story is a popular alternative: a modern retelling of the Fall of Man, i.e. bad women falling in love with godly men. In addition, there is, of course, a decent, yet sparsely populated, Bible section. There is always a possibility of finding a gem in a sea of dross, but frankly, I find bad bookstores to be rather depressing and a little frustrating. I would open a bookshop myself in an instant if I thought it could break even. Wonderful piece! I love all bookshops, even the bad ones, though I admit to being a bit depressed when I walk out of a store without a purchase. Still, as you write, I have found some odd treasures in a seemingly bad bookshop and I did snag a few copies of Flan O’Brien in the Dublin airport, which does (somewhat) defend the idea of the much maligned airport bookshop. I worked in my ideal bookshop: the Aspidistra in Chicago. It remains the only job I have ever loved. It falls into your first category, as it was overstocked with a wide variety of books, more than anyone would ever be able to read. Actually, I have always thought it better than The Strand, a truly overrated bookstore. (Take that, New Yorkers!) It remains the store I measure all others against, most falling short, though often I do find some liberation in the lack of options. I only read Anna Karenina because I saw a beat up pocket edition in a miserable shop in suburban Chicago. I might have skipped it at the Aspidistra, too overwhelmed by the Italo Calvinos and Mina Loys. Then there’s the rotating stands of depressed paperbacks found in delis and servos* and country town general stores. Usually full of bad romance and pulp sf, but worth giving a spin just in case there’s a gem. I found my copy of “Riddle of the sands” in one of these mini bad bookshops. I thoroughly enjoyed reading this piece ! I agree that, perhaps, there is no such thing as a bad bookshop. I work in a large brick and mortar store and enjoy the vast (truly) variety of books from which to choose. However, and this drives my sister crazy, I can’t resist going into small, out of the way new and used bookstores. I have found so many treasures in them – my signed copy of “Babylon by the Bay” by Herb Caen ( I absolutely LOVE anything having to with San Francisco). This collection of articles he wrote over his years at the Chronicle brings the city by the bay to life for me in a way no one else, except, perhaps Armistead Maupin, does. Different eras, different genres – fiction and non – enable me to go to my favorite place on this planet. Books and their authors do that. Finding a treasure in the dim recesses of a shop on a side-street or digging through the shelves in my own store – Indiana Jones has nothing on me! I agree with you, even a bad bookstoree has its value. Even though for some going to the library and spending precious time driving downtown and then looking through the bookstore, only to find that their book will have to be ordered by the store if they want it, is just too much of a pain when they can simply enter a search bar in Amazon, click add to cart, and then just wait a couple days until the book arrives, I still enjoy holding a real book. I am not sure what the future of real books will be, but i suspect it will take generations for real books to disappear. In a strange, near snobby, fashion I feel proud when I can walk into a so-called bad bookstore and find books there I recognize and (here’s the real test) still want to read. Not the mass market and supernatural teenage trash cluttering the shelves, but the rare gems that sit on the shelf for months collecting dust or, by chance of fate, re-shelved in the proper location that very morning of your visit. I feel well-read when I can find at least one good, proper novel (one that I wouldn’t be embarrassed to recommend to a former college professor, for example) and even more buoyed when I can find several. I agree there are no bad bookstores. Bad (i.e. poorly written and plotless books), yes. But no bad bookstores. Chances are, in trying to cater to a more “low-brow” type of reader, so-called bad bookstores have simply sold out of their already limited stock of classics and great literature. Hence, the narrow selection. A glass half-full perspective for the bad bookstores; and perhaps too generous but it’s nice to ponder!